FREE Salonpas Pain Relieving Sample! You are here: Home / FREEbies / FREE Salonpas Pain Relieving Sample! FREE Salonpas Pain Relieving Sample!! Get your FREE Salonpas Pain Relieving Sample! The strength of New Salonpas® Pain Relieving Patch has been improved with more medicine than the Salonpas® Original. 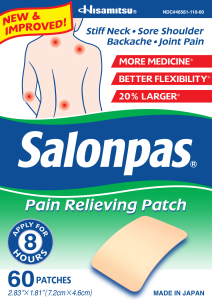 New SALONPAS® Pain Relieving Patch has three active ingredients in a more flexible, 20% larger and easy to apply patch. New SALONPAS® Pain Relieving Patch provides temporary relief of minor aches & pains of muscles & joints associated with arthritis, simple backache, strains, bruises, sprains!